A brilliant photograph needs the right moment, whether for capturing the light, the subject or the mood at their best or culturally for it to have impact. Pioneering fashion photographer Horst, certainly timed his moments right. The results of his 60-year long career, filled with catching arresting photographs, are currently on display at London’s Victoria and Albert museum until 4th January. Having briefly assisted, and occasionally modelled for Russian fashion photographer George Hoyningen-Huene (1900 – 1968), Horst Paul Albert Bohrmann (1906 – 1999) began his career in the early 1930’s, a time of transition for both fashion and photography. From the offset, his career trajectory evolved in perfect tandem alongside major developments in technology, aesthetics and the fashion industry, making him one of the most significant fashion photographers of the 20th century. Whilst the birth of fashion magazines can be traced back to the 18th century and some of the first ‘fashion photographs’ were taken in the 19th century, it wasn’t until after the First World War that both disciplines, to a certain extent dependent on each other, started to take shape in the way we understand them now. Vogue magazine, which up to this point had merely been a catalogue of dresses, began to transition into a fashion fairy-tale. Simultaneously, as camera technology developed, fashion photography started to gain foothold over illustration as a way for fashion to be imaged and with that, fashion photography professionalised. 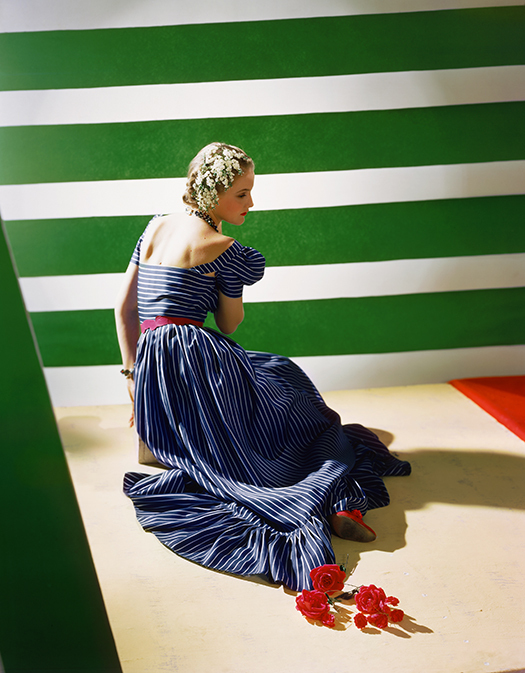 Horst picked up where Cecil Beaton, Edward Steichen and his mentor George Hoyningen-Huene, left off. Unlike his predecessors, Horst’s style marked an era of newness in image making with a style that captured timely dreamlike qualities of surrealism and Hollywood silver screen glamour in a way that was appropriate for magazines such as Vogue. His signature was marked by heightened use of contrasts where tonal qualities of light were mainly located at the opposite ends of black and white that gave his models statuesque feel, stage set compositions, classical posing that mimics painting which he studies at Louvre and trompe l’oeil effects. His work acted as a perfect bridge between imaginary worlds of illustration where anything was possible and photographic sur-reality. It was no accident that he went on to collaborate with the leading Surrealist artist such as Salvador Dali and Jean Cocteau. Unlike the photographers who developed their careers thought black and white lenses, Horst was part of a new generation of image-makers able to capitalise on the advances in technology that enabled them to produce colour photographs for publication from the offset. Horst’s employer at Vogue, Condé Nast played a big part in this, heavily investing on sophisticated colour reproduction printing. The impact of this was so transformative that the photographic historian Pamela Roberts describes the 1930’s as the most formative and dynamic decade in a century of colour photography. Whilst throughout his career Horst seemed to have preferred to work in black and white, his handle of colour ensured his name in history. Such was his talent that Nast’s business partner and adviser Lucien Vogel declared Horst the only gifted photographer the magazine had and the impact of his work still lives in Mario Testino’s glamour, Herb Ritz’s contrast, Nick Knight’s lighting and Tim Walker’s fantasy – both literally and laterally. The results of Horst’s work, predominantly for Vogue magazine, provide the backbone for the Victoria and Albert museum retrospective. The exhibit gently walks visitors though a well organized selection of over 250 photographs and sketches, retouching notes, tests and correspondence with collaborators along with the usual array of personal ephemera. The display features mostly black and white photography – also echoed in the monochromatic setting in which this work is exhibited – leaving little space for his colour work to be fully celebrated. Adding life to what could (but isn’t) otherwise be a two-tone story is the celebration of Horst and his collaborators. One doesn’t have to scratch the glossy surface of his glitteringly glamorous photographs too deeply to find a fascinating cast of characters in front of and behind Horst’s lens. Some of his sitters were famous whether Hollywood royalty or the more authentic European kind; Vivien Leign, Steve McQueen, Bette Davis Gary Cooper and Marlene Dietrich along with the Windsors and the Glücksburgs provided star power and prestige to his work. Little know names outside fashion such as Ludmila Leonidovna Feodoseyevna, Lisa Fonssagrives, Muriel Maxwell and Carmen Dell’Orefice represent the newly emerging cast of the first professional fashion models. The Swedish born Fonssagrives, originally a dance teacher was Horst’s favourite for her dancer’s hands and lithe figure. “I became a model because he made me one” she later credited Horst. Clothing of course has its part to play in this exhibition. Chanel and Schiaparelli are the loudest voices with their steady standing in the history of fashion and close personal relationship with well connected Horst. The story behind Horst’s most famous image of the Mainbocher corset taken in 1939, just before the Second World War, is suitably told with sketches and ‘before/after’ retouching images. The informative book that accompanies the exhibition sheds light to some of the significant collaborators behind Horst’s lens. Without Vogue editors Edna Woolman Chase (editor between 1914 – 1951) and Jessica Davies (between 1951 – 1963), there would not be 94 Vogue covers on display at the exhibition that Horst photographed. Diana Vreeland (between 1963 – 1971) on the other hand kept her ageing friend busy shooting interior stories for Vogue and House and Garden – these mark the last, and least enigmatic leg of the exhibition. Whilst trends in photography have drastically changed since Horst was at the peak of his career, his work feels genuinely timely again. It transports the viewer into a world that seems nostalgic but doesn’t look old. In fact, judged against the ‘realistic’ fashion photography style cultivated by the likes of Jurgen Teller and Terry Richardson that fill all the magazines these days, Horst’s work feels refreshingly new again. But that’s not a surprise; Horst certainly timed his moments right.